Pigeon is a wonderful meat – deep, gamey and tender (when treated properly) and it has been eaten for centuries across many cultures. Aside from the flavour, pigeon have always been an attractive prospect due to being a quick, easy-to-find source of protein – the eating of pigeon was especially ubiquitous in the wartime years when meat was strictly rationed. Wild birds are at their very best between September and November, plump and flavourful after greedily gorging on wild fruits but the autumnal season need not be strictly adhered to as farmed squab are generally of very high quality in the UK, ensuring their availability year-round. The more relaxed lifestyles and consistent feeding of these farmed birds make their meat tender and plump, so do not rule out this option. The type of pigeon you buy will depend on what’s available at that time of year and what you want to do with the pigeon. Pigeon meat tends to darken with age so, if buying wild birds, buy pigeon with paler flesh for quick-cooking methods. Young farmed squab have tender flesh with a delicate flavour. These birds may be more versatile than their wild counterparts due to the consistency in quality but if you prefer a more intense flavour, it’s best to opt for wood pigeon. They possess a deep, complex, mineral taste and with careful cooking, can be just as tender as squab. Buy wild birds that have nice plump breasts and a good distribution of fat under the skin. Look out for shot damage, and try to buy birds with the head and feet left on – this will give you a better idea of the overall condition of the pigeon. Only buy game from a reputable dealer. One breast per person makes a generous starter while a whole bird is suitable for a main course. 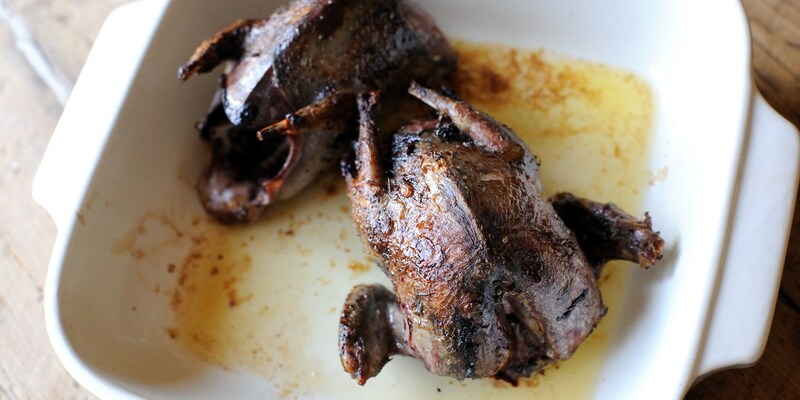 The best pigeons for fast-cooking are farmed squab and younger, plump wild birds. Quickly pan-frying breasts can yield beautiful results but remember that pigeon does not suit being served well done so aim for a pink finish. Rest the breasts for 4–5 minutes after cooking to keep them as juicy as possible and deglaze the pan to add even more pigeon flavour into sauces. Chefs have also noted the benefits of cooking pigeon sous vide, as Colin McGurran does in his Pigeon with textures of beetroot recipe. Cooking the breasts for 15 minutes or so at a moderate heat results in tender meat that has been cooked gradually and evenly, with all of the juices locked in. Aromatics can also be added to the sous vide bag to add flavour, though do not add too many as the flavour will be quite concentrated. Roasting pigeons is also a relatively quick process compared to other meats – simply brown the birds in a pan before roasting for around 10 minutes, or cover in butter before roasting for excellent results. Pigeon legs take longer to cook than the breasts, so slow-cook the legs separately then use a quicker method to finish off the crown as Matthew Tomkinson recommends in his Wood pigeon salad recipe. The legs are also wonderful when confited. For something completely different, Chris Horridge cures pigeon breasts in a spiced marinade for 48 hours then serves them carpaccio style. The variation in flavour between wild birds and farmed means that the flavour pairings should rely on the kind of bird you are using and how you are cooking it. Wild birds possess a deep, strong flavour that can take on a variety of bold flavours from spice mixes to rich berry fruits. Autumnal flavours pair well with pigeons generally – think nuts and root vegetables as in Pascal Aussignac’s Wild pigeon and Jerusalem artichoke recipe or earthy, sweet beetroot and tangy pickled mushrooms like in Matthew Tomkinson’s recipe. Mark Dodson continues the theme of earthy flavour combinations in his Wood pigeon with blueberry jus, beetroot and potato crisps recipe but ramps up the fruity element by pairing with a blackberry jus. Marcello Tully serves his pigeon with a citrus sauce to cut through the richness of the pigeon. Dominic Chapman takes elements from more traditional pigeon dishes such as redcurrant jelly, hazelnuts and a red wine reduction, and uses them to make a beautiful salad, with radicchio leaves, pine nuts and ham. Pigeon also works well in pies – not only is it a relatively cheap meat but it has a richer flavour compared with other poultry such as chicken. Greg Malouf flavours his Moroccan pie, Bistayeea, with braised, shredded pigeon and spices such as cinnamon and cumin.